The labels are written in by three distinct hands, one of which is Clearly Soane's. 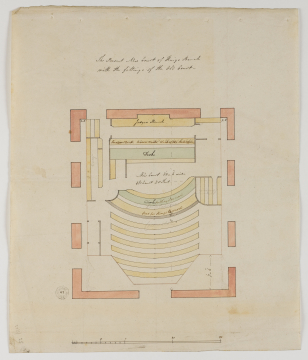 The coloured washes used to distinguish the seating arrangements of the Court follow those found on other related plans (e.g. SM 37/3/36). This plan, with its stated dimensions appears thematically related to concerns over accommodation and space, reflected in SM 53/7/3, though the latter's colour palette is different.